4-Day Cloverleaf Rolls - dough can be made up to 4 days in advance. GREAT timesaver for holiday meal planning!! Yeast, water, sugar, shortening, egg, salt flour and butter. SO delicious! 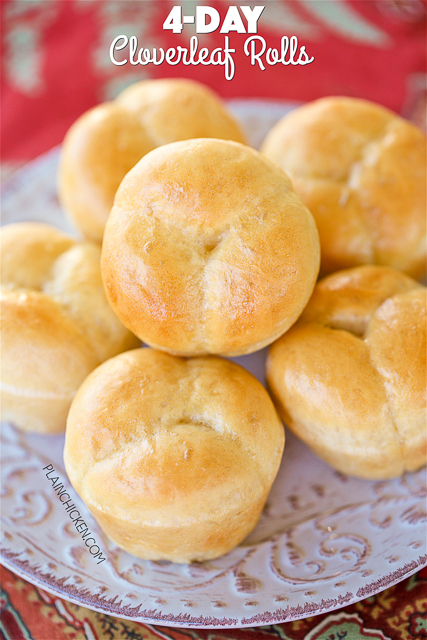 Makes 2 dozen rolls, perfect for the big holiday meal and leftovers!! Now that it is finally November, we can go full steam ahead with our holiday meal planning. I don't know about you, but I love make ahead recipes. They can be a big timesaver; especially during the holidays!!! The dough for these Cloverleaf Rolls can be made up to 4 days in advance. Mix up the dough and let it hang out in the fridge until the big day. These Cloverleaf Rolls smelled amazing while they baked! I couldn't wait to try them. They were delicious! All you need is a little butter. Honey butter would be good too - YUM! This recipe makes 2 dozen rolls. Perfect for the big holiday meal and leftovers! Combine yeast and warm water in a small bowl; let stand for 5 minutes. In the bowl on an electric mixer, combine yeast mixture, sugar, shortening, egg, salt and half of flour; beat at low speed with the dough hook. Gradually stir in the remaining dough, adding just enough to get a soft dough. Preheat oven to 400ºF. Lightly grease 2 regular sized muffin pans. Punch dough down; place on a lightly floured surface and knead 8 to 10 times. Shape dough into 72 (1-inch) balls. Place 3 balls in each muffin cup. Cover and let rise in a warm place until doubled in size, about 40 minutes. Bake for 10 to 12 minutes, or until golden. 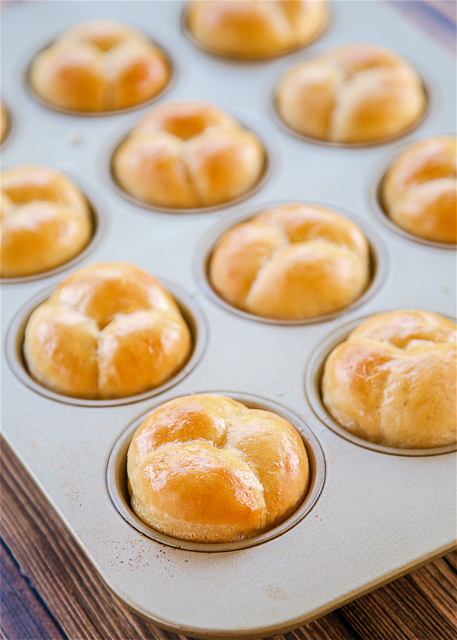 Brush hot rolls with melted butter. I only have a hand mixer - can I make these rolls without a mixer?